SINGAPORE COMICS & COLLECTIBLES: JSA VOL. 1 #67 (2005) "Part of the IDENTITY CRISIS event"
JSA VOL. 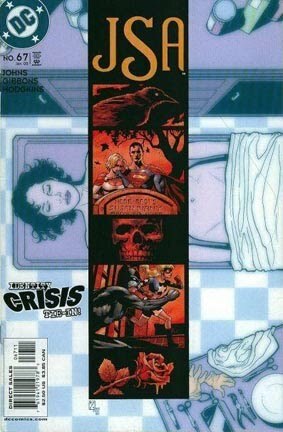 1 #67 (2005) "Part of the IDENTITY CRISIS event"
• PLOT SUMMARY: "The Autopsy" An IDENTITY CRISIS tie-in featuring guest artist Dave Gibbons (WATCHMEN, THE ORIGINALS) and guest-starring Superman! Doctor Mid-Nite and Mr. Terrific examine Sue Dibny's corpse in search of clues to the killer's identity, and they'll be shocked at what they find! By Geoff Johns. Cover art by J.H. Williams III.